Learn more about the prominent authors and writers who visit Ithaca College. Plus, check out more information on the visitors who come to the School of Humanities. This semester, Ithaca College welcomes several visitors to share their insights and expertise with the campus community. Thomas Sayers Ellis, author of The Maverick Room and Skin, Inc.: Identity Repair Poems, will visit campus in September to give a public reading as part of the Department of Writing Distinguished Visiting Writers series. Lan Samantha Chang visits later in October also as part of the Distinguished Visiting Writers series. 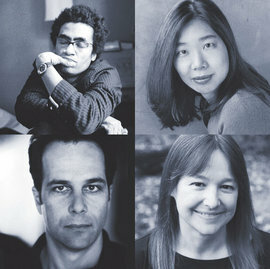 Chang is the director of the Iowa Writer’s Workshop at the University of Iowa and is the author of several award-winning books. Giving a public reading in late October is Philip Gourevitch, a staff writer for the New Yorker and author of We Wish to Inform You That Tomorrow We Will Be Killed with Our Families: Stories from Rwanda. Author, essayist, editor, and teacher Anne Fadiman will be on campus this November as part of the Distinguished Speaker in the Humanities lecture series.